Baba Amr neighbourhood of Homs is in desperate need of reconstruction. Homs, Syria: One year after fighting has stopped in the Syrian city of Homs, only 3,000 out of original 80,000 residents have returned to the neighbourhood of Baba Amr, where clashes in Homs first started in 2012. 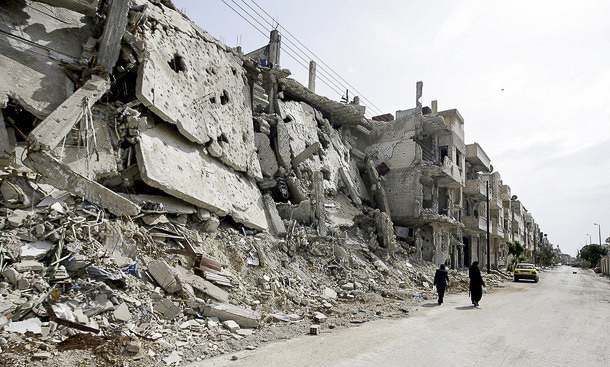 Twelve out of 36 neighbourhoods in Homs are now in desperate need of reconstruction. One of them is Baba Amr. Most are living in damaged and half-destroyed homes. Sabah and her family were among the first returnees. They escaped when their house was shelled. “When the house was shelled we felt a huge explosion. We ran out of the house. We looked up and saw that a floor had collapsed,” recalls Sabah, a returnee. Some 200 displaced families from other parts of Syria have also found shelter in this battered neighbourhood. Yousef is making do by selling produce from the back of his truck. “When I came to Baba Amr I saw that people did not have anywhere to buy from. The residents lent me money and it was helpful,” says Yousef, who was displaced from Aleppo. Having all been displaced at least once, the displaced and returnees are now collaborating to reclaim Baba Amr.